Eating only mono meals is going pretty well. I'm on my third food, so far, and have ended day two. This evening I've started my third fruit: Pineapples! Whew! I m stuffed! I blended 16 oz. of strawberries in the Vitamix to drink (that was yummy!) and then I ate an additional 6 oz. of whole berries. I don t think I would have been able to consume as much, had I not blended most of them. It was very filling and I know I won t be hungry until after dinnertime. So, now ends my strawberry day! There is one container of strawberries left that Jim and KDcat are welcome to consume! It s too early to notice much from the mono eating. Mentally, I am fully committed to doing the nine days of mono meals. I do not physically feel hungry. In fact, right this moment I feel quite full after my last strawberry meal. However, if I wasn t doing this mono eating, I d probably process up some sort of salty nut/cheese spread to consume. Is this because I need more calories, because I only consumed sweet food all day and I want to balance it out with something salty, or because I m used to feeling slightly numb and I m craving that feeling? Perhaps it s a combination of all of those things, in addition to some others that I haven t considered. I was starting to feel a little hungry, so I started my second food for my mono meals. A sweet person on a raw food support forum I daily visit suggested that I eat the foods in the order of the rainbow. What a clever idea, right ! So, that s what I m going to do, to the best of my ability. If something isn t ripe, I m not going to stick to the color order and eat it. If I feel like I just don t want a particular food that is the ?correct? color some day, then I ll choose something different. The order of the rainbow will be a nice guideline to follow when eating my mono meals, though! So, that brings us to my next food! The first were the red/strawberries. Now I m on to orange/oranges. I just ate four medium-sized navels. I m not stuffed like I was earlier when I ate more than I really desired of the strawberries. However, I am very satisfied and a bit full. I m thinking tomorrow should be an easy day, since oranges are easy to eat! I m wanting something salty, something with lots of flavor (from herbs and/or spices). I think reading raw food blogs is going to make this mono eating a bit difficult. I see beautiful recipes and want to eat them. Normally, when I am eating a mixture of raw foods in my meal, I am full and satisfied---and images of raw recipes simply inspire me to make something similar for myself someday. When all I m eating is fruit, however, it makes me want to eat those things immediately. I salivate, even though my stomach isn t even empty. I m thinking I m going to thoroughly enjoy the day of celery, when I have something that isn t sweet and has a slightly salty taste to it! Last night I dreamed I was eating bread! I was walking around with a piece of buttered bread in my hand, and then I brought it up to my mouth and mindlessly took a bite. I then realized I had bread in my mouth and I took it out. I asked myself, ?What am I doing? I don t eat bread!? Then I remembered that earlier I had eaten a piece without realizing what I was doing, and I had chewed it up and swallowed it. I was glad to have been more aware of what I was doing this time, and that I didn t consume the entire piece of bread without even thinking about it. I know to some the dream may look like deep-seeded emotional issues around food. But, that s not what it is. Yesterday, my daughter was actually walking around with a piece of buttered bread, mindlessly munching on it. ;-) I ve dreamed of bread in the past, however, and I wonder if it s because my body has never been able to fully detox itself of the wheat I ve consumed over my lifetime. You see, I still use NamaShoyu which contains some wheat; therefore, my body is still getting small doses of wheat on an almost regular basis. Someday, I will give up the NamaShoyu, because I really don t like relying on packaged/bottled foods in order to enjoy the vegetables and nuts I consume. I was very tired last night and went to sleep not long after 10pm. I woke somewhere around 7am, my mind alert but my body still a bit tired (mostly my eyes). My tongue feels like it s a bit coated isn t it too early to start some sort of detox? I ve only had four mono meals, so far. It seems like nothing would be happening, yet, since it s so soon. Whenever I don t consume garlic and/or onions for a while, the smell of them on others is potent. [Pause here to giggle a bit: my daughter just came into the office carrying a piece of buttered bread. I took a moment to talk with her about mindless eating, too.] Anyway, our herbs are starting to wake up in the back yard and yesterday my daughter had eaten some chives. She was on a different floor of the house and I got a whiff of the scent and I called up to her: ?Someone has been eating fresh chives!? She was amazed that I could smell it on a different floor, especially since it was earlier in the day that she had eaten them. Some people don t like the smell of chives and garlic, but I love both, especially when they are on the breath of those I m talking with. It s 9:40am and I m not hungry, yet. Today is my day of oranges and I think it s going to be easy. I ll blend up about six and drink them for breakfast, and then eat some whole ones for lunch (and a snack if I m hungry any time before dinner). I haven t decided what to eat after the oranges. I have pineapples on my kitchen counter and some bananas on top of the fridge (my next rainbow color is yellow). I ll make the decision when it s time to eat dinner, I guess! I blended six Valencia oranges, with the seeds, in the Vitamix for my breakfast. I guess there were a lot of seeds in them, since the drink was a bit bitter. It was okay, though. I drank all of it and it was very filling. I m wondering if I should eat first thing in the morning, even if I m not hungry, so that I can get more calories each day. I can t decide if I should do that, or if I should just eat when I m hungry (which seems like the natural way to eat). I wasn t really hungry, but I wanted to sit with Jim and KDcat while they were eating. So, I ate four navel oranges. They were very tasty and easy to eat. I must admit, however, that the look and smell of the cucumber and nut ?cheese? was the food making me salivate. It s a bit earlier than I wanted to eat for dinner, but I m hungry. So, I ve decided to eat two oranges and then later I ll eat whatever I decide to eat for my yellow mono meal! Okay, those two oranges must have completely stimulated my appetite because I m HUNGRY! J The bananas aren t ripe enough (I prefer them heavily spotted with brown and never consume them if they have any green at all), so that means it s going to be pineapples for dinner. I wonder what it will be like blended into a smoothie? I think I m about to find out! Oh, my!!! That was delicious! 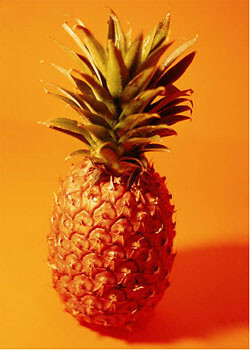 I ve decided that I m going to blend the pineapples for every meal. Wow! It was acidic, but oh so yummy and sweet. If anyone reading this has a high-power blender, I recommend blending up an entire pineapple (after removing the skin and core, that is). You won t be disappointed! An entire pineapple yielded 4.5 cups of pineapple smoothie. I couldn t drink more than half of it, but maybe I ll be hungry before bedtime and I ll drink the rest of it later. I have more energy today, but I don t know if it s because of the mono meals or because the sun has been out for a few days in a row. It has been beautiful outside, so I ve been spending a lot of time outside soaking up the sun s rays. It feels so great. I m looking forward to moving to a sunnier location before the end of the year. Mentally, I feel a tiny bit more focused. Again, however, is that from the sun or the mono meals? I feel excited, in a way, about this nine days of mono meal eating. It s a great way to get used to not consuming so many fats (nuts, seeds, oil, avocados), which is my big goal during this second year of 100% raw. So, it s exciting to be getting closer to that goal in a special way. I ve been taking time to meditate in the mornings and I ll try adding meditation in the evenings, as well. I m feeling pretty good, overall. Doing mono meals has to be amazing for your overall digestion. I think this is great for someone (like me) who struggles with digestive disorders or for anyone that experiences bloating after eating a "normal" meal. Wendi...this is a great experiment and I am enjoying reading about it. I do, in a way, listen to my cravings. In the past, especially when I was first transitioning to raw, I would crave things. I'd ask myself, "What is it about this that you are craving? Is it the oil, the salt, the herbs, the sweetness, etc." and then once I figured that out, I'd have something raw to satisfy that craving. With this mono meal eating, however, I want to follow my plan on nine days because I feel drawn to experiencing what it's like. How interesting that onions zap your energy! I've been off onions and garlic during this mono eating, but I'm going to pay special attention to how I feel after eating onions when I'm done with the nine days. I totally agree that raw foods gives us the ability to listen to our bodies. I'm not kidding when I tell people that I think eating more raw, fresh veggies that one summer kind of woke up part of me that had been sleeping--a part that didn't know to eat more raw, fresh foods. I love you, yardsnacker! Thanks so much for stopping by and reading my blog! Actually, I think if someone is going to mono eat for a longer term than just nine days, it would be best to do it very mindfully. I say that because as I'm plugging my daily intake into a nutrition analysis program, I see that I am not getting enough calories or nutrition. It would be easy to become deficient in some vitamins/minerals if someone did this long term without being very careful. You are probably right that mono meal eating would help your digestion at times, though, when you are done with your juice feasting. I'd just recommend looking into a bit more if you were going to do it for more than transitioning back into raw meals. I'm so proud of you with how well you are doing with the feast! Your insight into all that is happening inside and outside of you is remarkable. Lots of love to you, Penni!